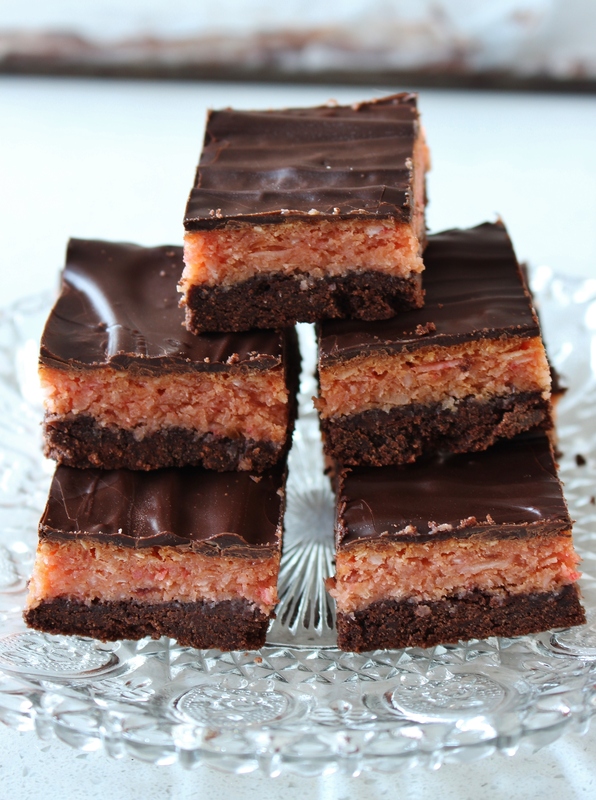 Cherry and coconut filling coated in dark chocolate atop a cocoa biscuit base. It’s everything you love about a Cherry Ripe bar in gluten free baked form! 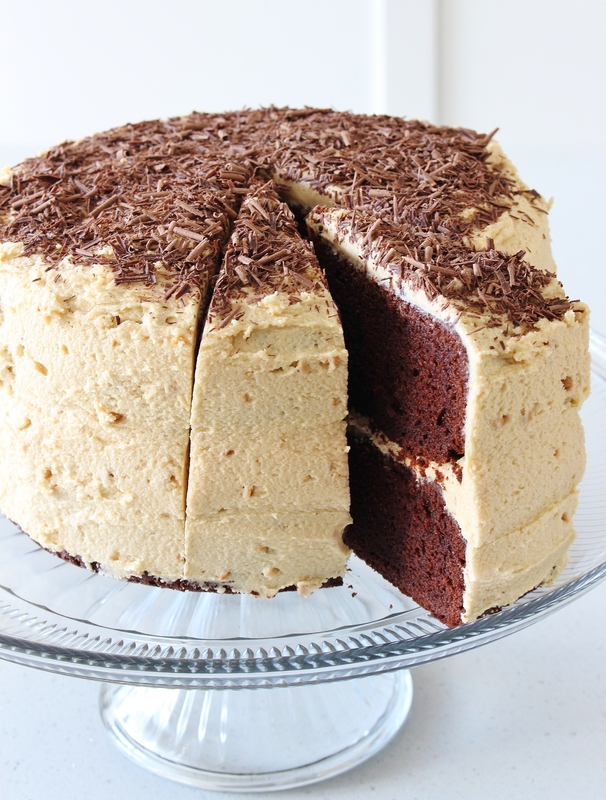 Get out a cold glass of milk and put your feet up with a slice of this delight by your side! Cherry ripes were not one of my favourite chocolate bars as a little kid, but when I got to high school I took a liking to them. There’s something a little naughty sweet about the sweet cherry coconut filling coated in dark chocolate. It’s the perfect chocolate bar for a teenage girl. And it’s actually one of the oldest chocolate bars sold in Australia! There’s your Random Australian Fact for the day. This slice is just like a cherry ripe bar met a biscuit and they became friends. Delicious, delicious friends. These bars start off with a very simple biscuit base that is pressed into a tin and partially baked. Then you chop up pretty pink glace cherries and mix them together with sweet condensed milk, and shredded and dessicated coconut and bake it for a little while until the condensed milk caramelises slightly on top. Once this naked cherry ripe bar (ooh) has cooled the bar is topped with molten semi-sweet chocolate. Just look at those swirls. I could not get enough of this slice. I loved the not-so-sweet biscuit topped with the sweet and sticky cherry-coconut filling and the deeply dark chocolate coating. Paired with a cold glass of almond milk this is the afternoon delight I would choose after a long sticky summer run. This would also be the perfect treat for boardgame night. It’s a little more of a grown-up’s treat than a treat for kids given the dark chocolate and it’s just so moreish. Give yourself a treat this weekend and leave the mini chocolate bars for the kids. I know I’ll be sneaking a few slices while I’m scaring little trick-or-treaters! Preheat your oven to 160C (320F) and line an 8-inch square baking tin with baking paper. In a large bowl beat together softened butter, caster sugar, and vanilla essence until light and fluffy. Add egg and beat well. In a small bowl whisk together cocoa powder, buckwheat flour, white rice flour and brown rice flour. Add flours to wet ingredients and mix until well combined into a sticky dough. Place dough into the lined baking dish and use the back of a spoon to press the mixture into the tin. Ensure it is as level as possible. Bake base in preheated oven for 10 minutes. Then remove and allow to cool slightly. Use a small food processor to finely chop glace cherries. Place cherries, condensed milk, and both coconuts and mix well. Spread filling over the base evenly. Bake filling for 20 minutes or until the top is slightly browned. Remove from oven and allow to cool completely before topping with chocolate. Chop dark chocolate roughly and place in a microwave safe bowl. Heat in 30 second bursts, stirring well with a metal spoon between microwave bursts until the chocolate is melted and smooth. Spread melted chocolate over the cooled slice. 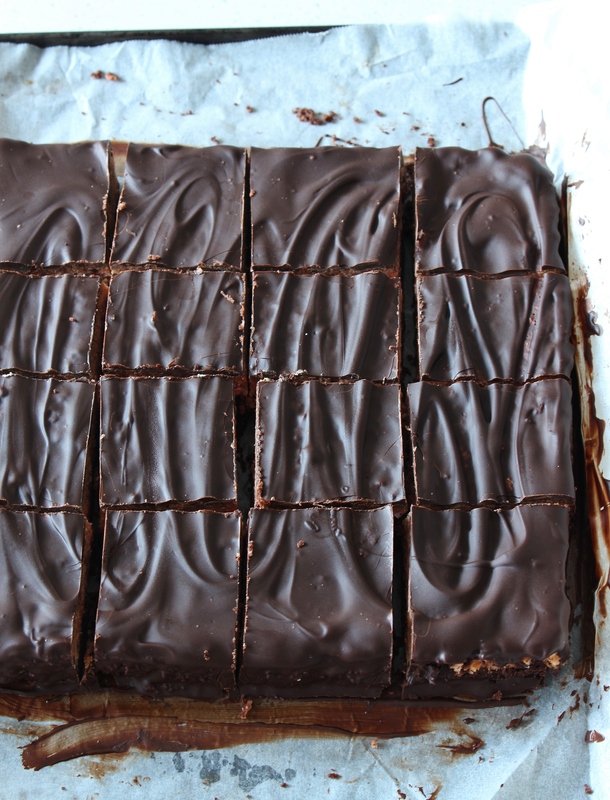 Chill until chocolate is completely set and then use a very sharp knife to cut into squares. I think we’ve had a good run of non-rebelliousness these past few decades. I didn’t steal your car keys or money from your wallet. I was a teenager who enjoyed showering and personal hygiene. I didn’t get so much as my ears pierced until I was 24. But my sweet Mama, times they are a-changing because today I’m rebelling against one of your strictest rules: no dried fruit in chocolate baked goods. I know this might see me written out of the will, but you have to believe me: it’s worth it. You see the raisins are plumped up in a bit of vanilla rum and then folded into midnight chocolate brownie batter. They bake up chewy and moist. Each bite is punctuated by sweet rum-soaked raisins and bittersweet chocolate chunks. 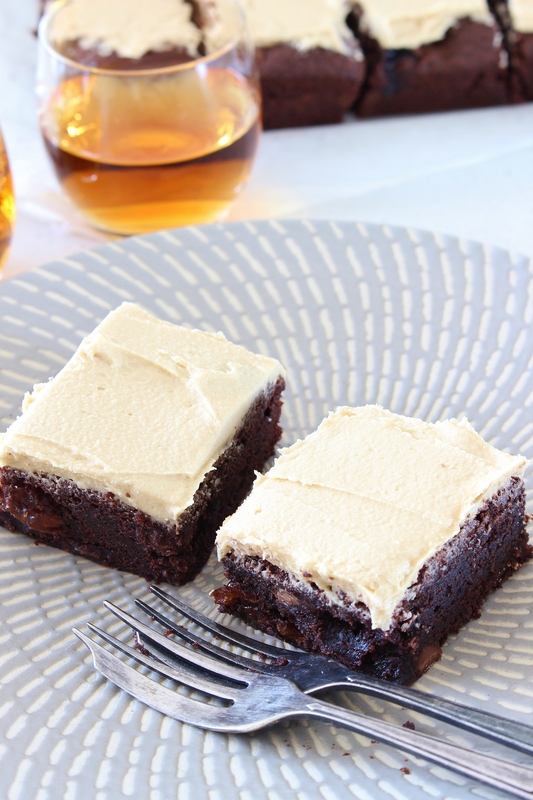 And then, because you always taught me that more is more when it comes to desserts, these chewy, rummy brownies are frosted with brown sugar rum frosting. Mother dearest, this frosting is everything. It’s rum-enhanced evenings under Caribbean skies, dark midnight snacks by the refrigerator light, all the merriest of moments in one fluffy brown sugar mouthful. 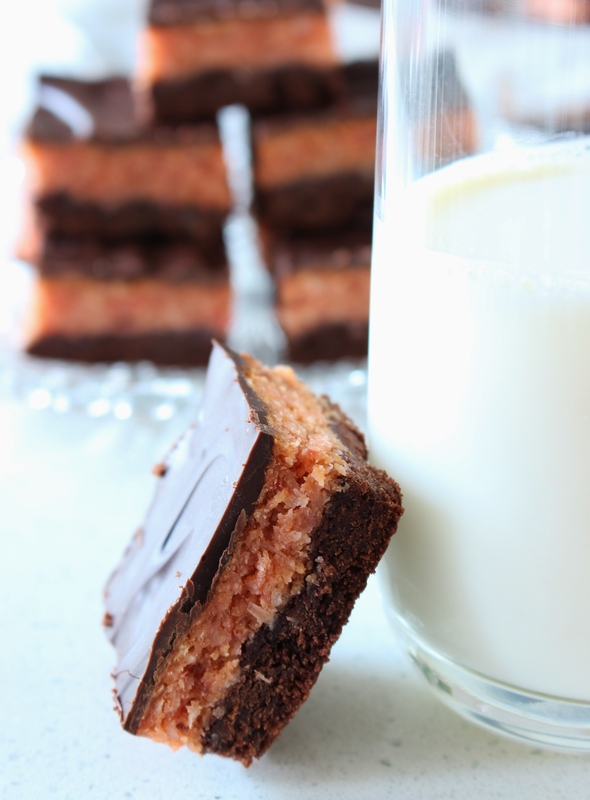 These are pirate trap brownies, desert island cookie jar brownies, totally over-the-top Friday night brownie-instead-of-a-cocktail brownies. I hope you can see it in your heart to forgive me some day. Until then, I will be sitting in the corner with a chocolate stained smile and rum-sticky fingers. I got your back. Eat these in the shed and don’t share with Molly. Preheat your oven to 180C (350F) and line an 8-inch (20cm) square tin with baking paper. Place raisins in a small bowl and pour over rum. Allow to sit while you prepare the brownie batter. In a medium mixing bowl whisk together white rice flour, buckwheat flour, and cocoa powder. 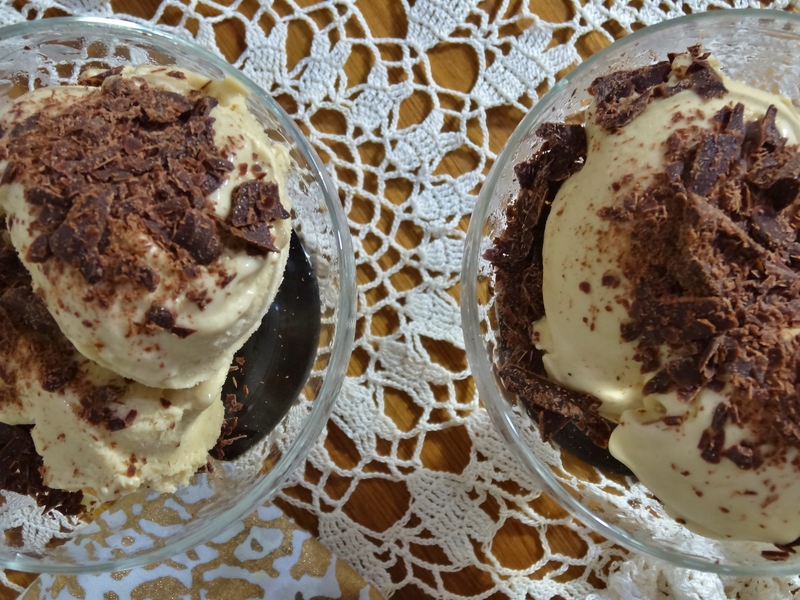 Place chocolate and butter in a large microwave-safe bowl and heat in 30 second blasts, whisking well in between blasts, until chocolate and butter are melted and smooth (mine only took 1 minute total, but it will differ depending on your microwave). Allow to cool slightly. Whisk eggs lightly and add to the chocolate mixture along with caster sugar, vanilla extract and whisked dry ingredients. Stir until smooth. Add raisins and any leftover soaking liquid and chocolate chips and mix until distributed. Pour batter into prepared baking tin and bake in preheated oven for 35 – 40 minutes or until a skewer inserted into the middle comes back with only a few moist crumbs clinging to it. To make the frosting place all ingredients into the bowl of a standmixer fitted with the paddle attachment (you can use a large bowl and a handheld mixer instead) and beat until light and fluffy. 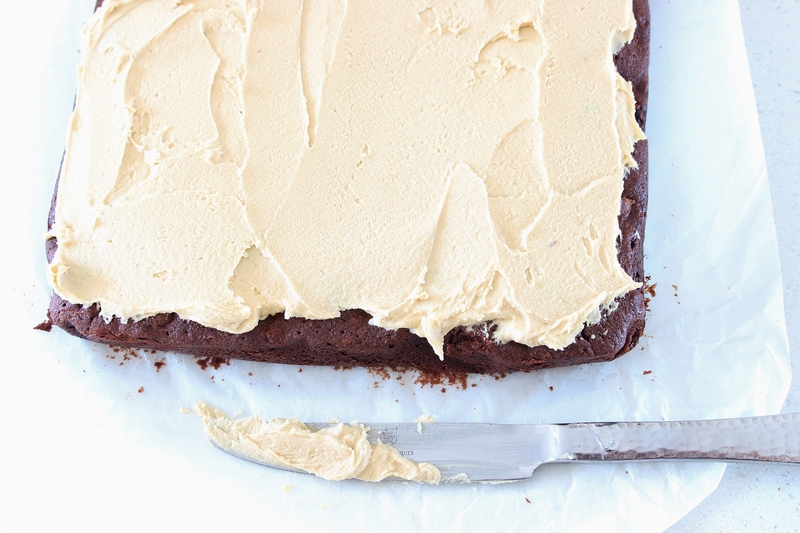 Smooth frosting over the cooled brownies, cut and serve. 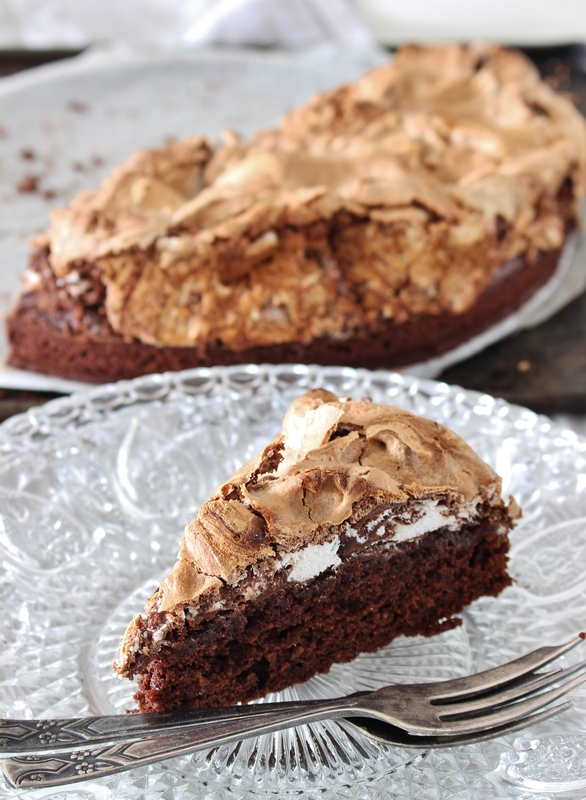 Bittersweet with a hint of spice this dark Mexican chocolate cake is topped with clouds of sweet, chocolate-ribboned meringue. 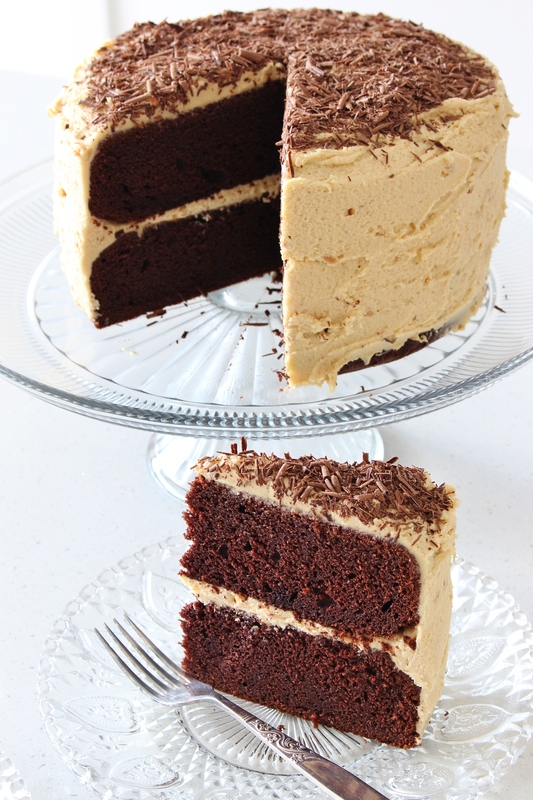 An impressive gluten free cake that is simple to make that awakens every dark chocolate dream you’ve had. I love chocolate paired with spice. One of my favourite chocolate memories (everyone has those, right?) is lying on a bunk bed in a tiny little hostel room in New York with my best friend Casey talking about our adventures of the day while we devoured the (then) newly released Lindt Chocolate with Chili. That trip to New York was the first time I was really awakened to the thought of pairing chocolate with all sorts of spices, and how each spiced creation can be greater than the sum of its parts. We sampled chocolate with chili, divine milk and white chocolates spiked with cardamom, and seashell chocolate sprinkled with cinnamon. A whole new world was opened up to me. When Casey threw a Mexican themed family dinner a few weekends ago, I knew it was the perfect time to create a spicy, sweet chocolate treat. 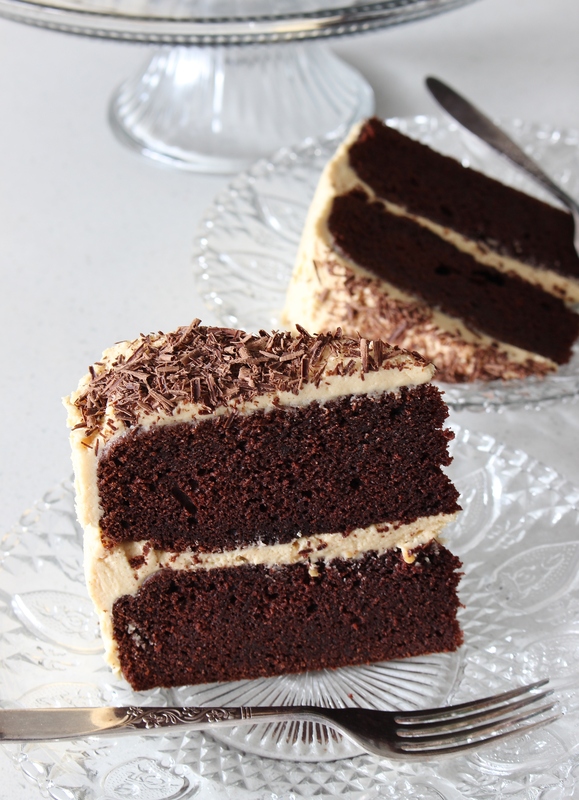 The bottom of this cake is a fudgy chocolate cake with a hearty dose of hazelnut meal for texture. An otherwise beautifully dense chocolate cake it is made unique with a sprinkling of cinnamon and cayenne pepper. Enough cinnamon so that it both complements the dark chocolate, but also so that it stands out as a key ingredient. 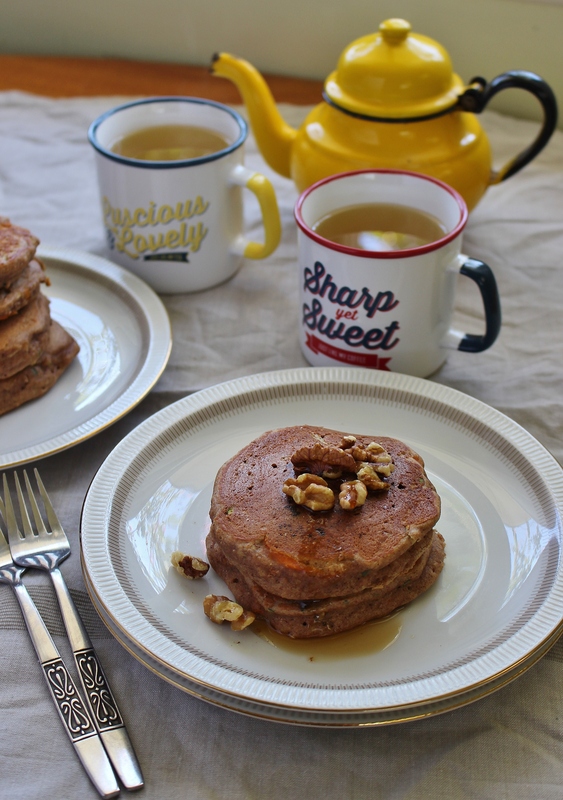 I added just a touch of cayenne pepper so that I could taste a mild sparkling of heat – this is still dessert after all! You could leave the cayenne out entirely for a milder spiced treat. Just look at those chocolate peaks. Yum. 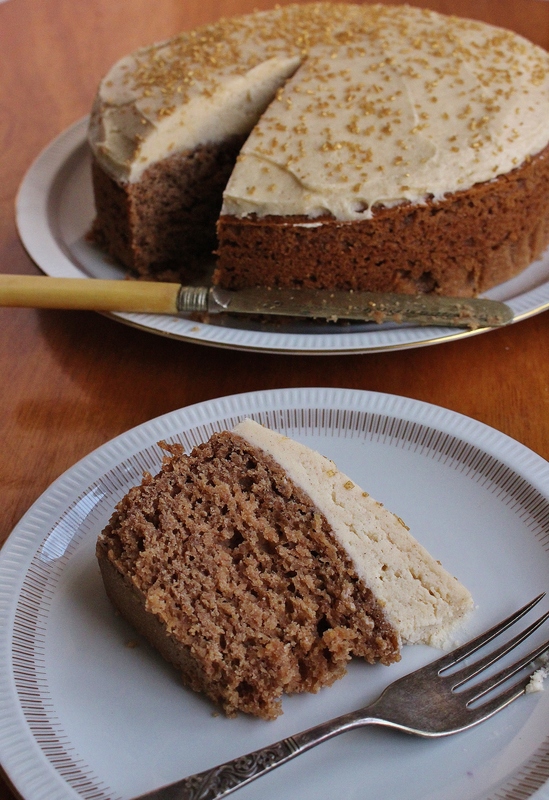 Although this cake looks very complicated, and it will certainly impress your eating audience it is very simple to make. There are two main parts to the cake and each is quite easy. Once again this sweet and sinful treat is greater than the sum of its parts. The bottom layer is an easy melt and mix chocolate cake. Super simple. 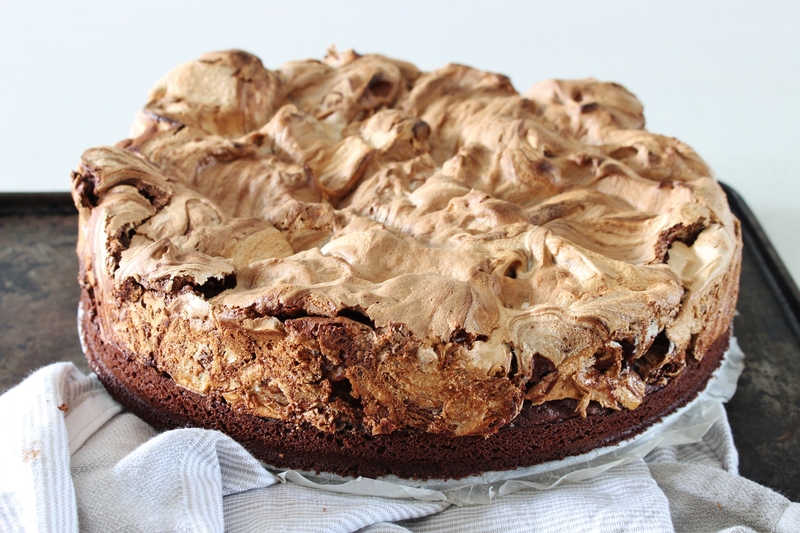 Once your chocolate cake is baked and cooled slightly you make an easy meringue topping with melted chocolate folded through and then gently plop it on top and slide the cake bake into the oven to crisp up the meringue a little. Simple, but truly delicious and inspired. 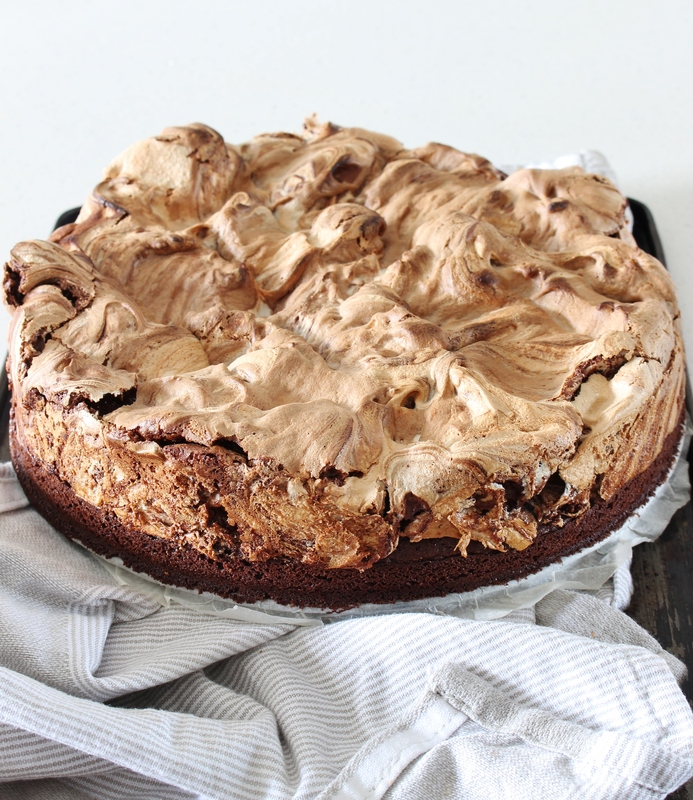 The meringue is crispy sweet on top, and beneath the crackly surface it is fluffy, sticky and sweet and slightly under-baked with pockets of melted dark chocolate. This is the cake you make when you want people to realise that gluten free baking is just as delicious and exciting as gluten-full baking. This is the dessert you make when you want to impress and treat your dinner guests, workmates, or beloved to something special. I can imagine this would make a delightful birthday cake with a large scoop of vanilla or cinnamon ice cream, or just some simple whipped cream. Or, eaten out of the container when you come home a little tipsy from too much sangria at your friend’s Mexican-themed family dinner party…. No judgement. Just bittersweet, spiced chocolate deliciousness. 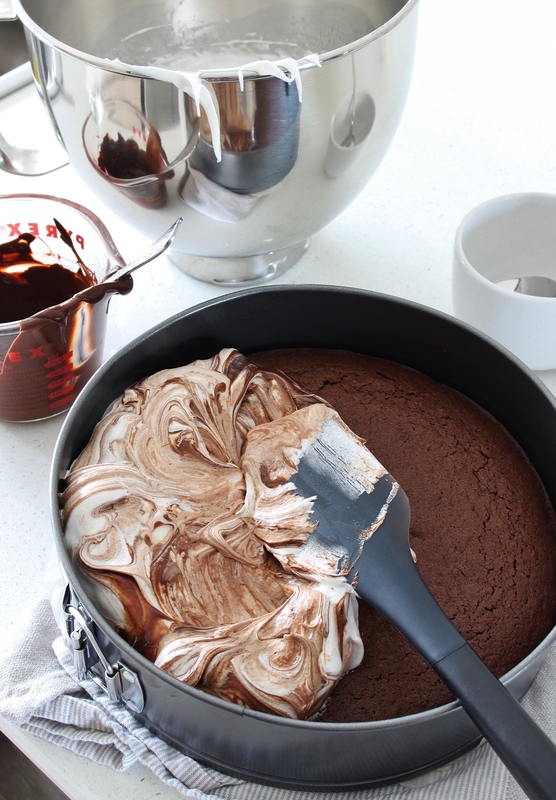 Tip: make sure your bowl for making the meringue is very, very clean and dry otherwise your egg whites will not whip. Preheat your oven to 160C (320F) and butter an 8-inch (20cm) round cake tin very well. Line the bottom with baking powder and set aside. In a medium bowl whisk together buckwheat flour, rice flour, hazelnut meal, cocoa powder, baking powder, cinnamon, and cayenne pepper (if using). Whisk until no lumps remain. In a large microwave-safe bowl place chopped butter and chocolate. Microwave in 30 second bursts and stir well with a metal spoon in between bursts until chocolate and butter are melted. Remove from microwave and allow to cool slightly. Lightly whisk eggs and add to the melted butter and chocolate along with the sugar. Whisk until smooth. Add flour mixture and whisk until smooth. Pour into prepared tin and bake for 35-40 minutes or until a skewer inserted into the middle comes back with only a few crumbs clinging to it. 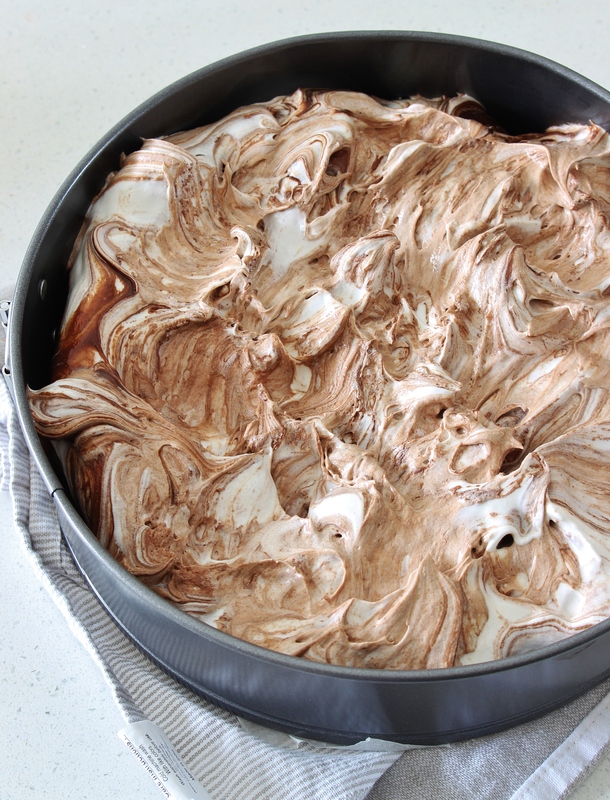 Remove cake from oven and allow to sit at room temperature while you prepare the meringue. Increase oven heat to 220C (430F). Add caster sugar 1 tablespoon at a time and whisk until sugar is completely dissolved. 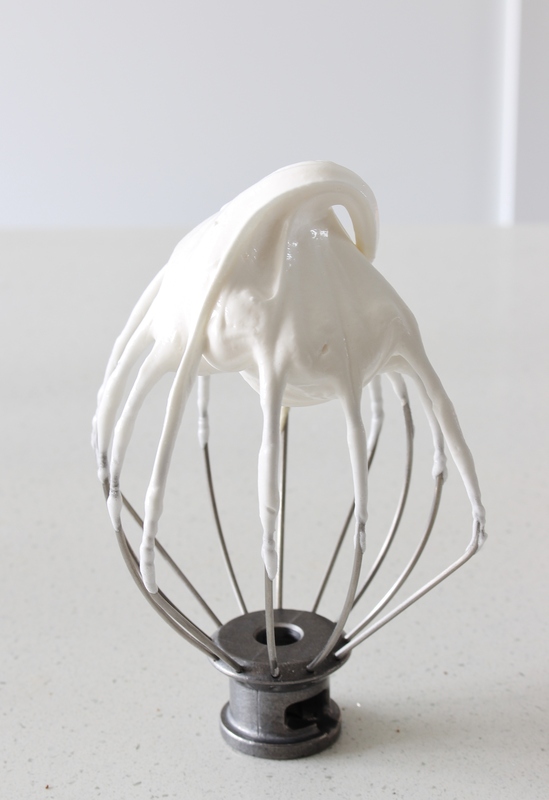 Whisk in vanilla and beat until stiff, glossy peaks have formed. Place half the meringue mixture into a large clean bowl. Add half the melted chocolate and briefly fold through. Only about 3-5 folding movements to maintain the marbled effect. 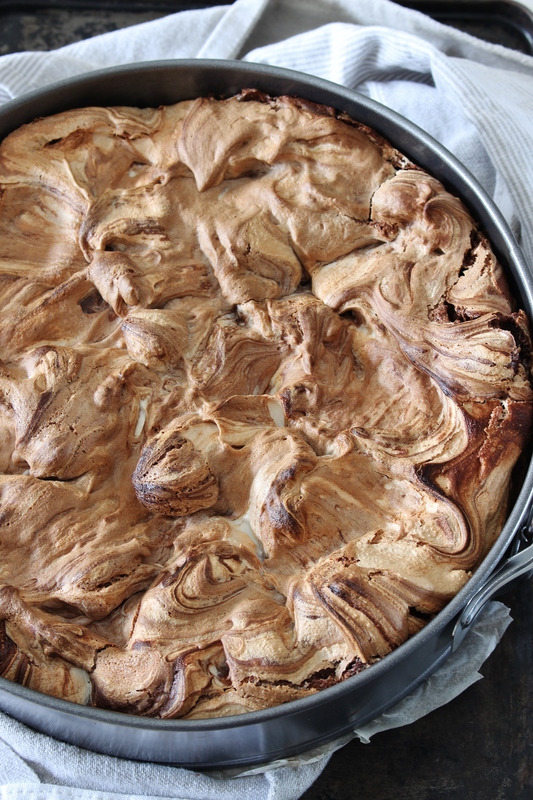 Spoon swirled meringue onto the cake. Repeat with remaining meringue and chocolate. Baked in the oven for about 10 minutes or until the meringue is firm on top. Chewy, oaty, chocolate chunk filled morsels with a little sprinkling of something from the garden. 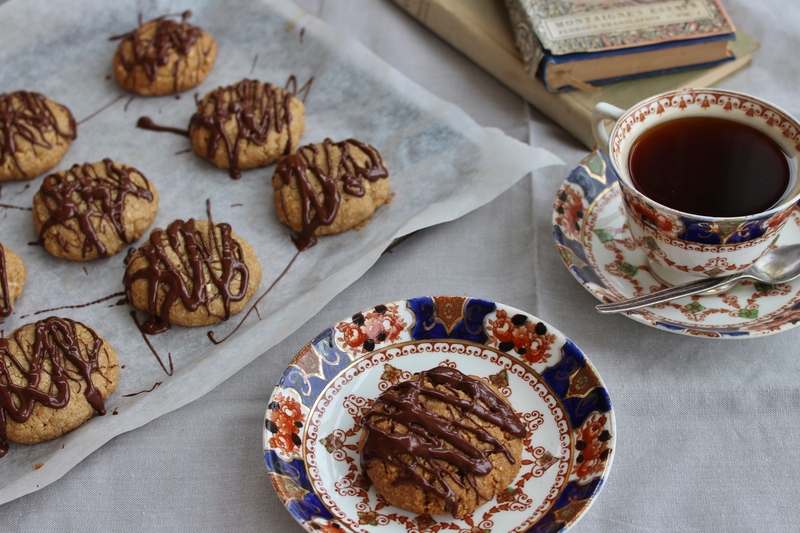 These cookies are my new small batch gluten free favourite that I make when I need to feel just a little justified at baking cookies at 9 o’clock on a Wednesday night. I try to keep my treat foods limited to the weekend, apart from a square or two of dark, dark chocolate while drinking tea and watching a little pre-bed television (side note: does anyone else watch House of Cards? Is anyone else completely in love with Claire’s wardrobe?). 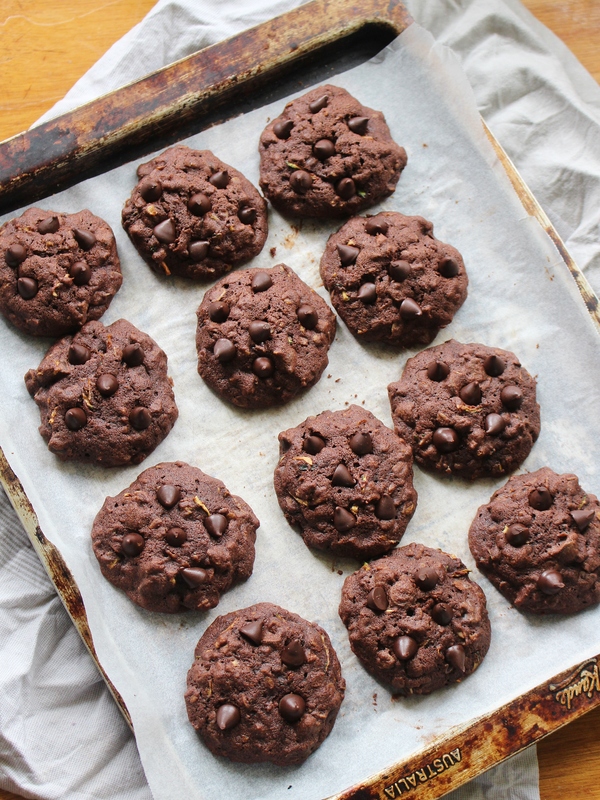 Now, I am not one for deprivation, but allowing myself a little chocolate during the week and saving my big treats for when I am baking on the weekend makes those indulgences even more special, which is something I have had to learn about how my body, mind, and I relate to ‘sometimes foods’. But then, there’s the Wednesday cookie. You know what I’m talking about even if you call it by a different name: #winowednesday ring a bell anyone? The Wednesday cookie is the treat that you know you don’t quite need, but you need it at a deeper level. You need it because you just sat through an eleven hour meeting. You need it because you went to the gym at 5 am and didn’t get home from work until 7 pm. You need it because you want to change into stretchy pants and indulge in some midweek brain-draining television. Enter: the Wednesday cookie. Now that you know about the Wednesday cookie, you need to know that I have a few rules for my Wednesday cookie indulgences. I want a small batch so that I don’t find myself with two dozen extra cookies after I have had my little treat. 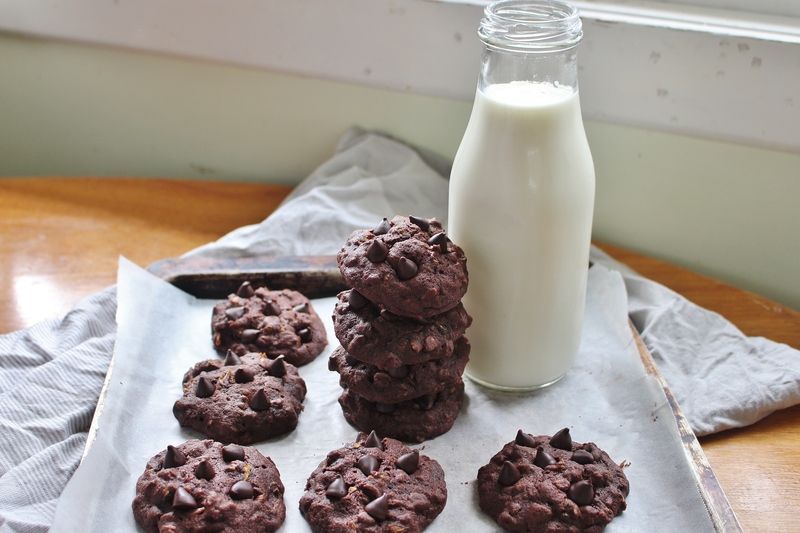 I want something rich and truly indulgent so that my cravings are fully satisfied in just one or two cookies. 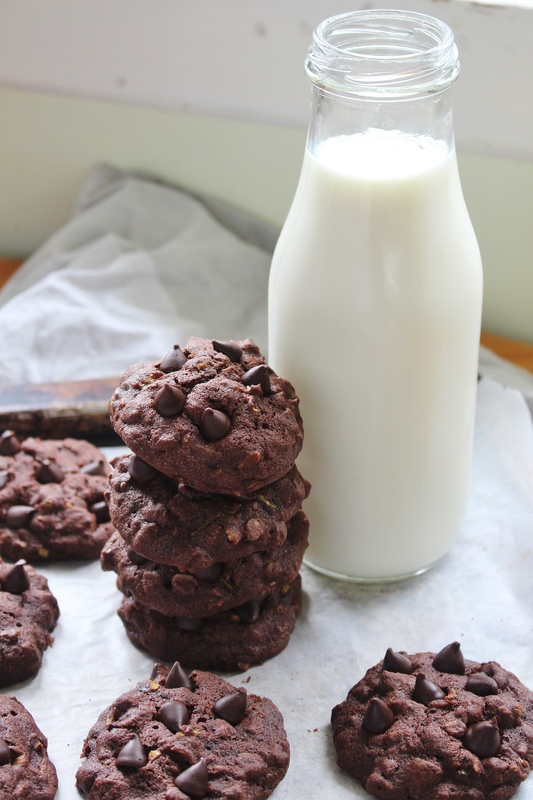 Wednesday cookies also need to be easy to make while you are putting together dinner, which these are apart from a little time chilling (time to eat dinner and wash the dishes). 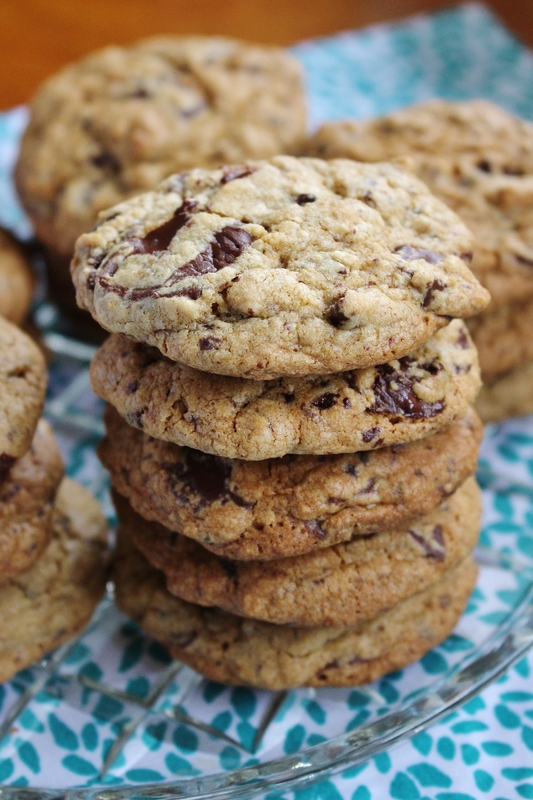 Once the cookies are baked I keep them in the refrigerator – it adds a little extra chewiness; though, I can attest that these are also perfect eaten warm off the tray. Melted chocolate chip smiles make Wednesday nights all the sweeter. 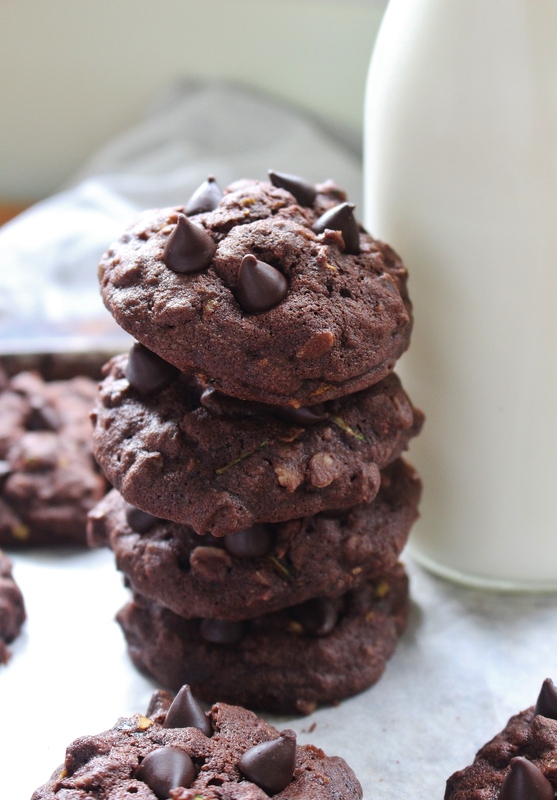 My Chocolate Chocolate Chip Zucchini Cookies are filled with dark chocolate chips and chewy rolled oats, and some grated zucchini, you know, so that your indulgence is tempered with a little bit of green too. Because, it’s only Wednesday after all! You need to chill this dough for 20 minutes before baking. This is important to obtaining the perfect texture. If you can’t tolerate oats, you can leave them out, or replace them with quinoa flakes. In a small bowl whisk together buckwheat flour, sorghum flour, white rice flour, cocoa powder, baking soda, salt, and cinnamon. In the bowl of a stand mixer fitted with the paddle attachment (or in a large bowl using a hand mixer) beat butter and brown sugar together until pale and fluffy. Add egg yolk, vanilla extract, and milk, and beat until well combined. Reduce speed to low and add whisked dry ingredients. Mix until completely combined. 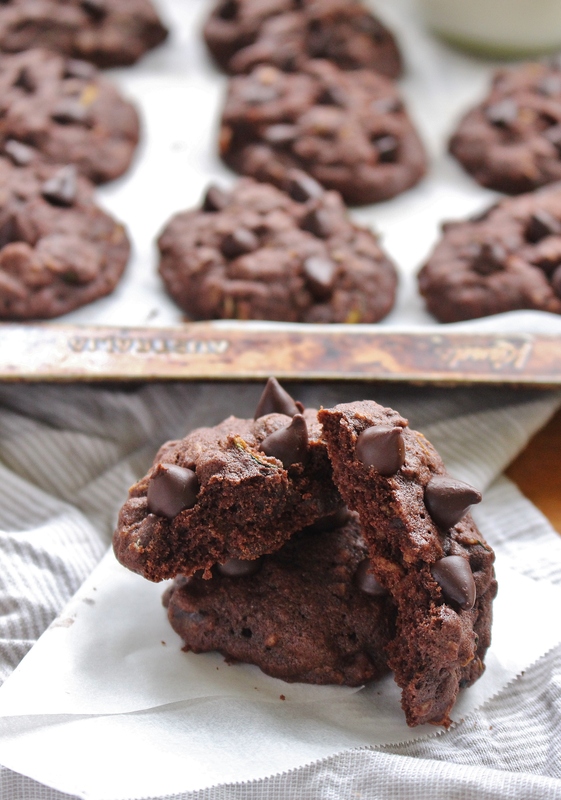 Switch to a wooden spoon and mix in chocolate chips, oats, and grated zucchini. Preheat oven to 180C (350F) and line two baking sheets with baking paper. Roll tablespoonfuls of dough into balls and place on lined baking sheets. Leave space for spreading. Bake for 12-15 minutes or until the edges are golden. The centres will still be soft (this makes for chewy cookies). Remove and cool completely on baking sheets. Store cookies in refrigerator for maximum chewiness for up to four days. Fudgy,dark chocolate brownie bites topped with creamy sweet white chocolate buttercream are the perfect last minute gluten free sweet treat for weekend celebrations. In under an hour you can have them on the table or wrapped up to give to the ones you love! Tomorrow is Easter Sunday and these tiny double chocolate treats are my contribution to our family morning tea. I made these as an Easter gift for Chris’s parents, and they were so quick and easy and full of my favourite sweet flavours that I just needed to make them again! I based my brownie bites on my favourite melt and mix brownie mixture. These brownies are based on melted chocolate and butter with a simple dump and stir method, which yields a chewy brownie, and they feature a double-chocolate dose with the addition of cocoa powder to the mix. Double chocolate? Double yum! White chocolate buttercream is my new favourite buttercream. 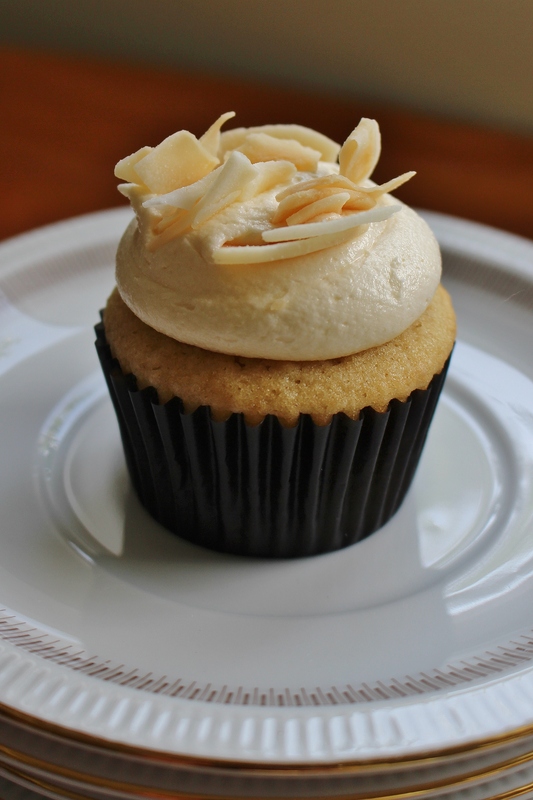 I could (and have) eaten this sweet, caramel, fluffy frosting until I feel sick. The pure sweet blankness of white chocolate buttercream contrasts with the slightly bitter dark chocolate brownie bites so well. These might be tiny treats, but they make an impact. Each little cake is just enough to satisfy any chocolate cravings that your Easter eggs might not have satisfied. And they are just so cute! 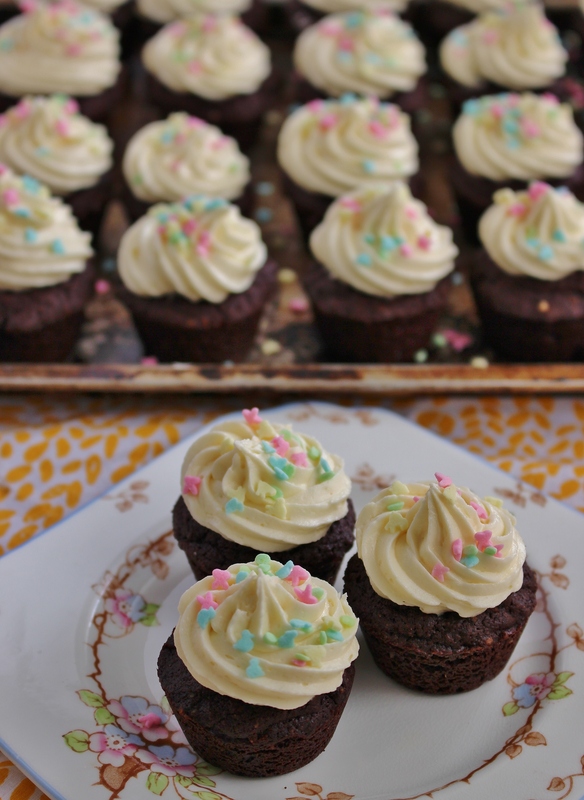 If you look closely at the sprinkles on top of my little brownie bites, they are tiny little pink rabbits, blue birds, yellow chicks, and green eggs. I loved these pastel sprinkles when I saw them at the cake shop a few weeks ago and I was so excited to use them in my Easter baking. If you need a last minute treat for the table, try these delicious triple chocolate treats, and if you have kids who want to help make Easter gifts these are perfect for little hands. I hope everyone has a sweet holiday with plenty of time with their families. Happy Easter to you all. Gluten Free | Makes about 24 bites | Leftovers will keep in an airtight container in the refrigerator for up to three days. Preheat oven to 160C (320F) and grease a 24 hole mini muffin pan. In a large saucepan melt butter and chocolate together over a low heat. Stir until smooth. Remove pan from heat and stir in all remaining ingredients. Divide brownie batter evenly between holes in the tin. 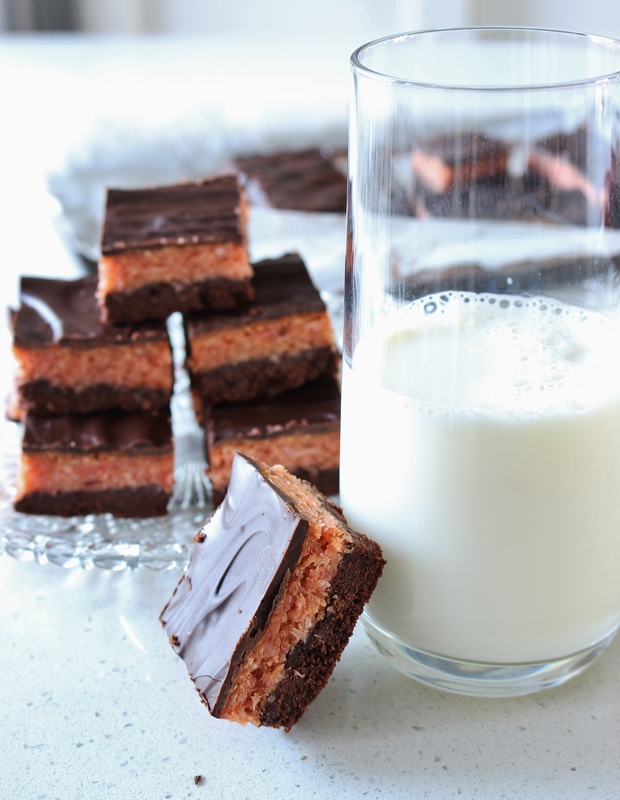 Bake until tops of brownies bounce back when lightly touched, about 15-20 minutes. 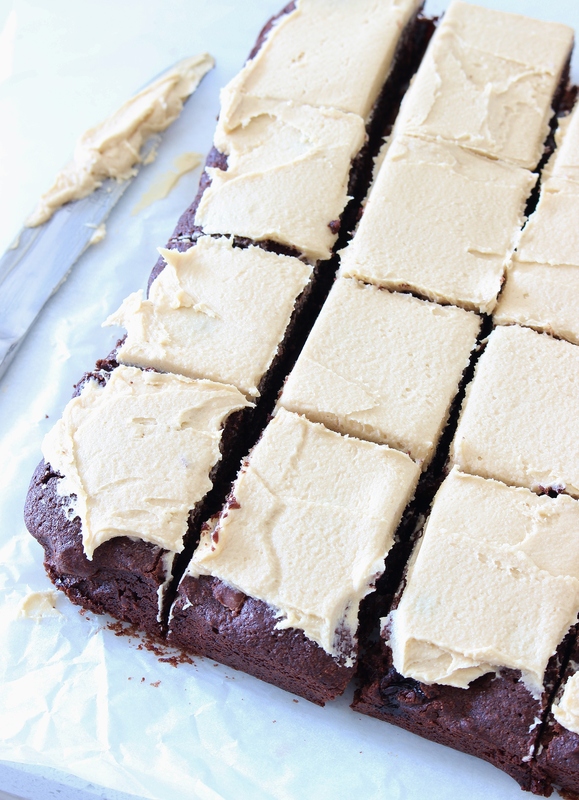 Allow brownie bites to cool completely before frosting and decorating as desired. To make the frosting. Melt white chocolate and allow to cool to room temperature. Beat butter in the bowl of an standmixer (or in a bowl with a handheld mixture) until light and fluffy, about 2 minutes. Add cooled white chocolate, icing sugar, milk, and vanilla essence. Beat until fluffy, about 3 minutes. Frost and decorate brownie bites as desired. I used a piping bag fitted with a small star tip. 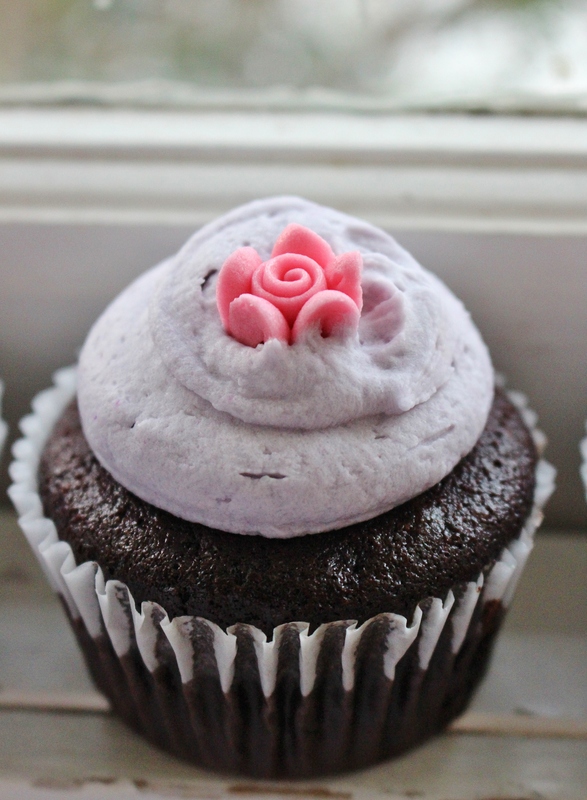 You are going to love my latest homemade gluten free cupcake creation. These fluffy, moist, deeply chocolate cupcakes use only one bowl in their creation but they taste like they came straight from a fancy bakery. 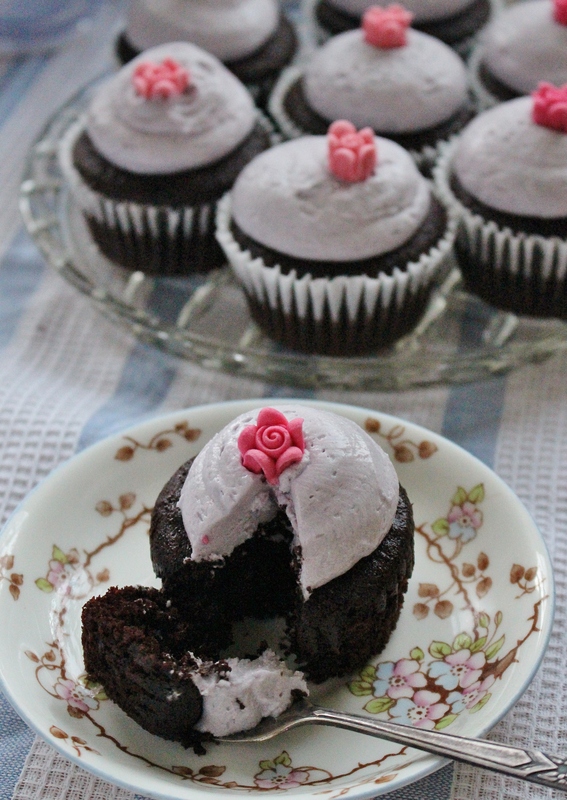 I have topped these deep, dark chocolate cakes with rosewater buttercream for a fairy-floss contrast perfect for any celebration. Sunday is International Women’s Day and it’s time to celebrate the wonderful, inspiring, intelligent, amazing women in our lives. I made these cupcakes to celebrate some of the women I am grateful to call friends and family. These cupcakes are my new favourite thing. So moist, dark and chocolate filled but so easy to make. We start with a foundation of gluten free flours: hazelnut meal, buckwheat, brown rice, and white rice. Each of these plays its own special part in making sure the final product is moist and fluffy, and not sandy or crumbly. 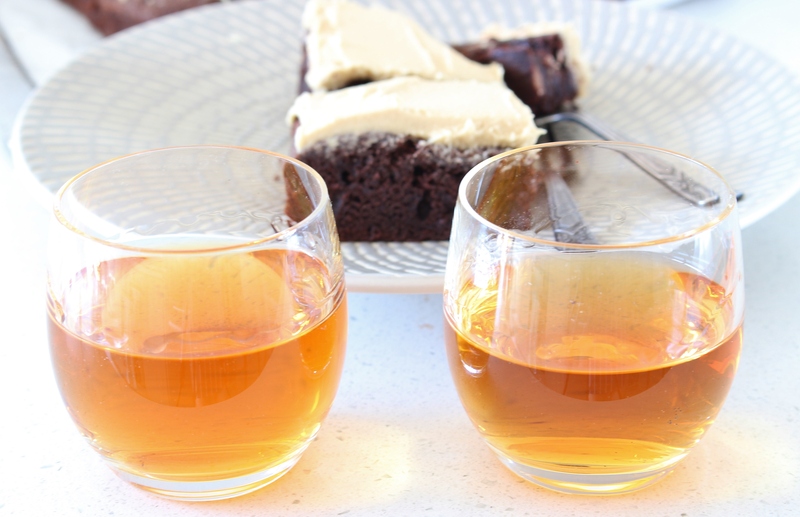 Getting the right balance of gluten free flours is important when you set out to create a classic and these four make for a moist, tightly crumbed cake that resembles your favourite childhood chocolate cupcake, with a darker adult twist. 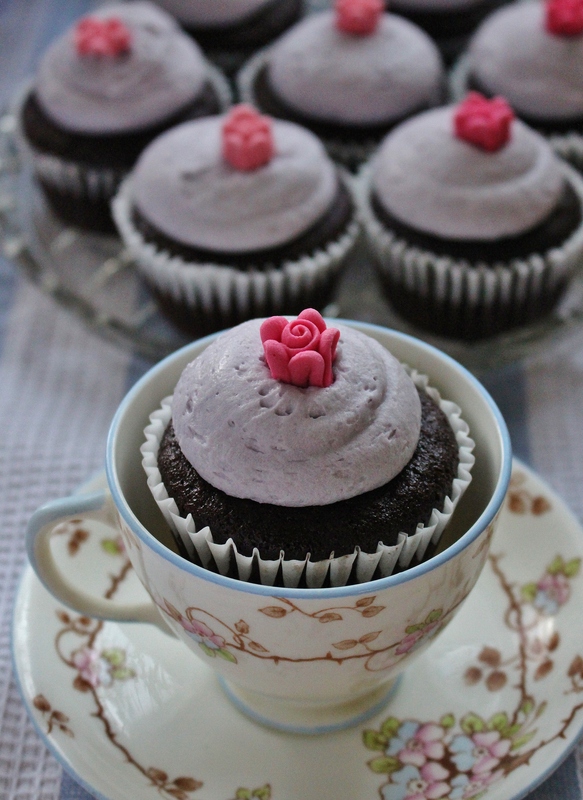 If you are new to gluten free baking, these are the cupcakes I would recommend. They are super easy (literally, dump everything in one bowl and hit mix) and they are guaranteed to turn out perfect, just-as-you-remember-them cupcakes that are friendly to your sensitive tummy. 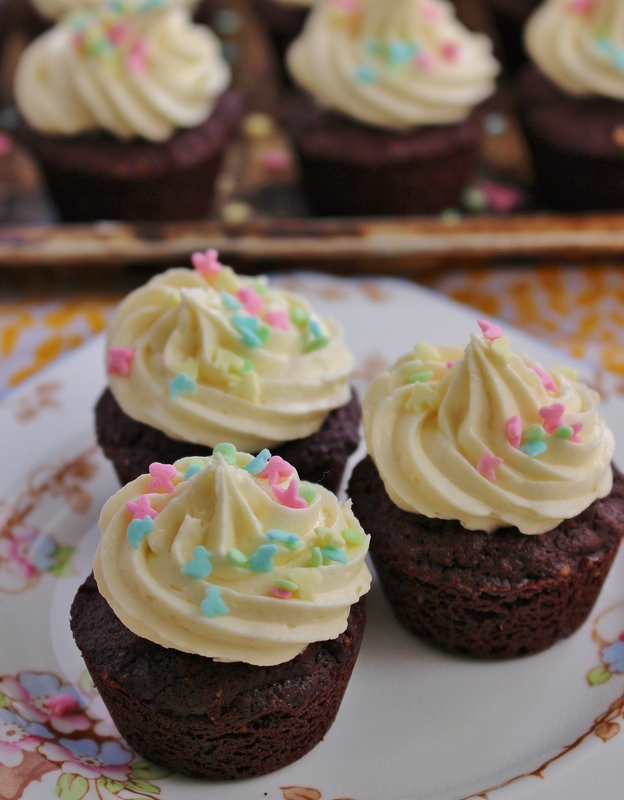 The rich chocolate taste in these one-bowl chocolate cupcakes is due to two special reasons. One: use the deepest, darkest cocoa you can find. Two: a strong cup of coffee is one of the wet ingredients. When coffee meets chocolate in this way you can hardly taste the coffee, but oh-boy it makes the chocolate shine through. 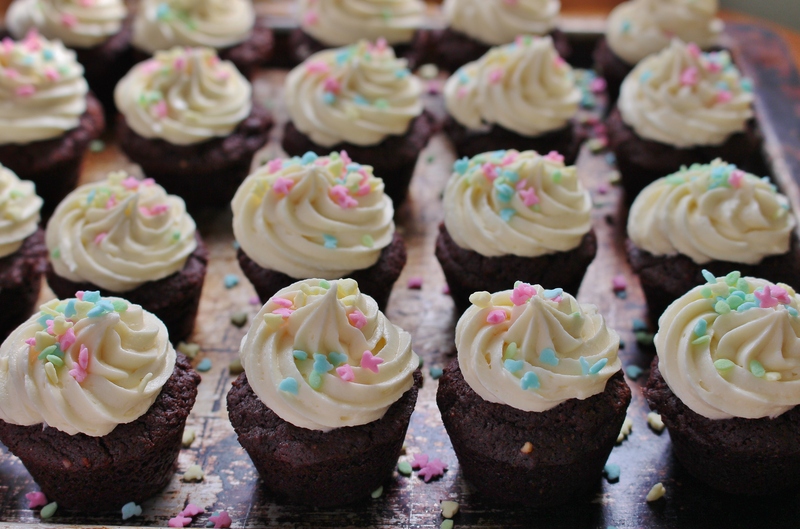 These cupcakes are a dance between a brownie and a cupcake, and we get to enjoy the splendor bite-by-bite. 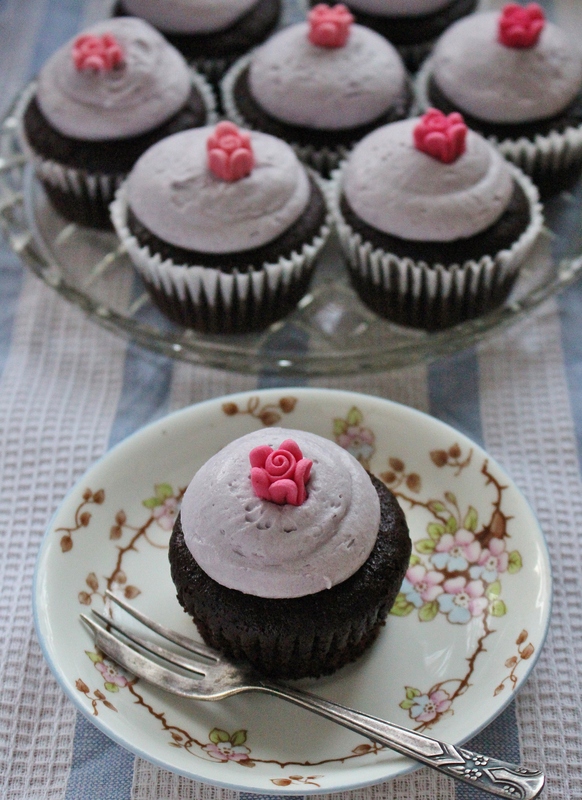 I topped my cupcakes with the lightest, prettiest rosewater buttercream in the colour of International Women’s Day. When Chris tasted this buttercream he smiled and said ‘it tastes like fairy floss’. Perfection. Rosewater can be too sweet for some people, and sickly in the wrong amounts. Start with the lesser amount listed in the recipe, and adjust to your taste. Another rosewater buttercream secret is to add a pinch of salt. Don’t be afraid of a little salt in your sweet, like the coffee in the cupcakes it enhances the main flavour rather than obscuring it. These one-bowl cupcakes are a new classic: bittersweet meets fairy floss sweet for an upgrade on the usual chocolate and vanilla combination. These cupcakes are a lot like the women I know. Deep, complicated, and complex with foundations and memories that run the tender edge between bitter and sweet; and, at the same time sweet, pretty of spirit and capable of lifting your spirits in just a moment. Good women. May we know them, may we be them, may we raise them. Preheat your oven to 180C (350F). Line two 12-hole cupcake tins with papers for 15 cupcakes. In the bowl of a stand mixer fitted with the paddle attachment (or in a large bowl with a handheld mixer) whisk together the hazelnut meal, buckwheat flour, brown rice flour, white rice flour, cocoa, sugar, baking soda, baking powder, and salt. Whisk until very well mixed. Mix together warm water and instant coffee and add to the bowl along with the egg, rice bran oil, milk, and vanilla extract. Mix on medium until just combined, then increase speed to medium high and mix until smooth and glossy, about three minutes. Spoon batter into cupcake papers. Fill only to halfway full to avoid your cupcakes spilling over. Bake for 20-25 minutes or until the tops spring back when lightly touched. Rotate trays from top to bottom halfway through baking time. 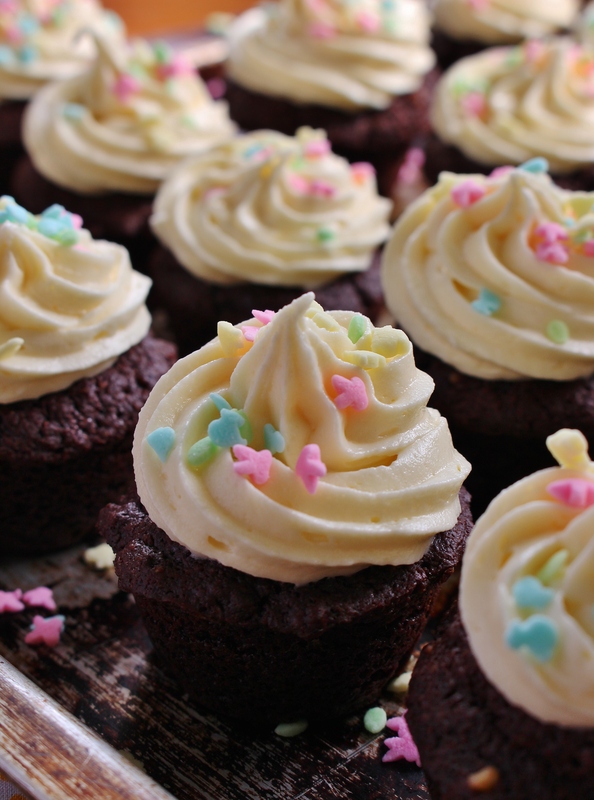 Remove cupcakes from oven and cool completely before frosting and decorating as desired. In the bowl of a stand mixer beat butter until pale and fluffy. Add remaining ingredients and beat until soft and fluffy, about 3 minutes. 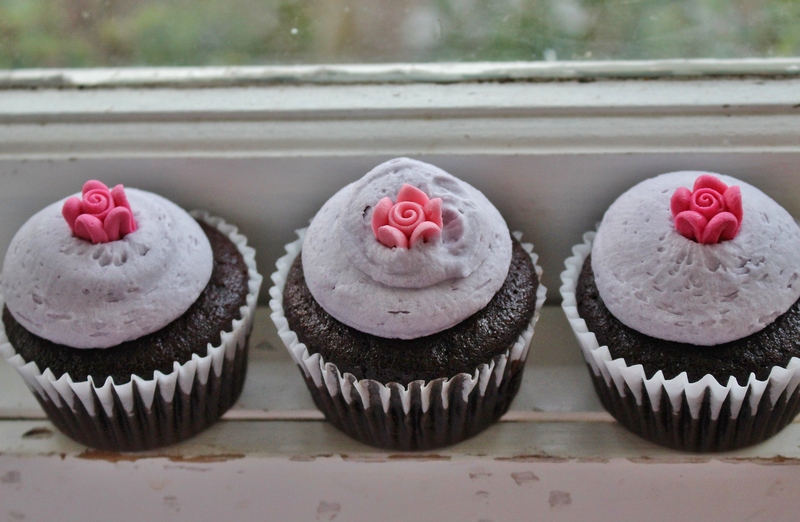 Wait until cupcakes are completely cool before frosting and decorating as desired. 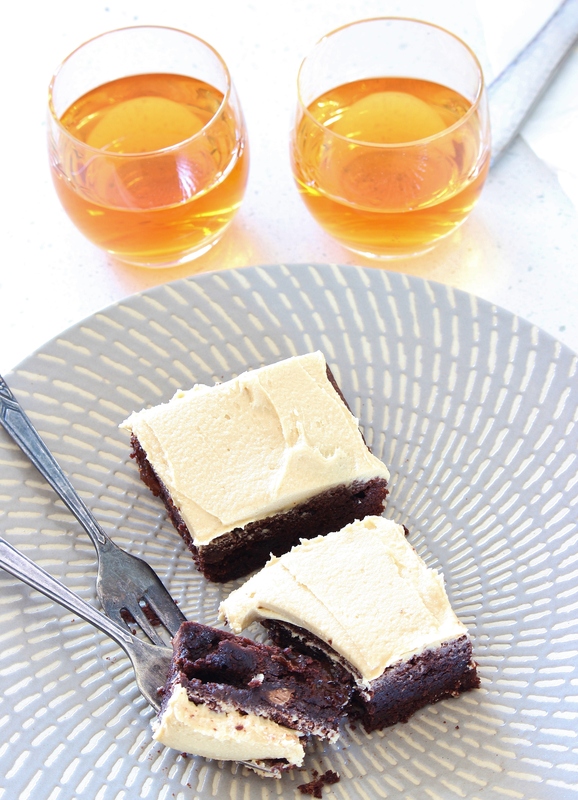 Beetroot adds a smoky, earthy background to the dense chocolate of these brownies, and a sweet sharp cream cheese swirl is the perfect decadent finishing touch. 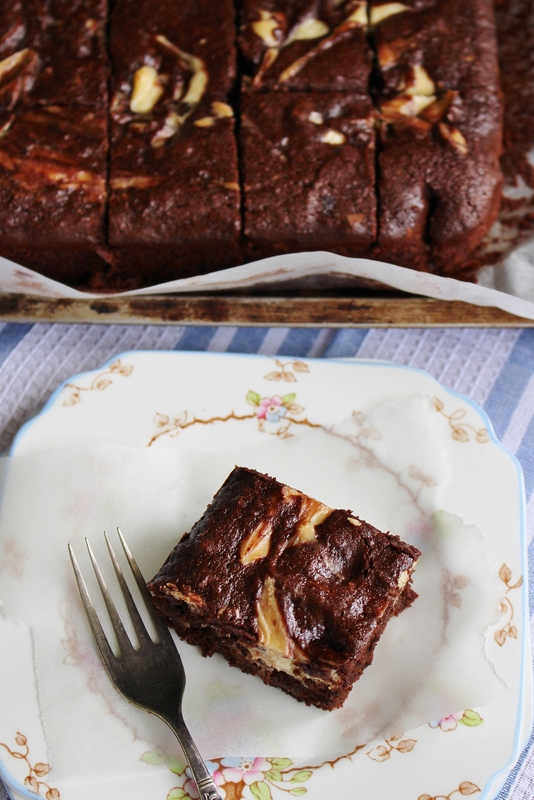 Cream Cheese Swirl Beetroot Brownies are an indulgent gluten free treat perfect for sharing with your special someone. I wanted to call these heart beet brownies (get it? ), but I thought that might be a little too cheesy for you all. If there is a holiday that encourages us towards cheesiness, Valentine’s Day has to be it. I know it’s not really a holiday, and companies make a lot of money off gifts, chocolate, and flowers just for the sake of one day, but isn’t it nice that even in today’s slightly cynically-bent world that we can still find time to celebrate love. The desire for love is universal, and I don’t just mean romantic love. I mean love as in finding someone, or ones, who really see you and accept you just as you are, but are invested in helping you to reach a higher form of yourself too. As a wise man once said ‘Love is the only shocking act left on the planet.’ To stand in front of someone, a lover or a friend, just exactly as you are and let all the walls down is difficult. And when that person sees you raw and scarred and shining your own light and finds room in their heart to take you in without asking anything of you in return, then you have found love. I have that love in my life in many different forms, and to be reminded, even one day a year to celebrate those people who let me love them, and love me in return, is a valuable thing. Now, about these brownies. 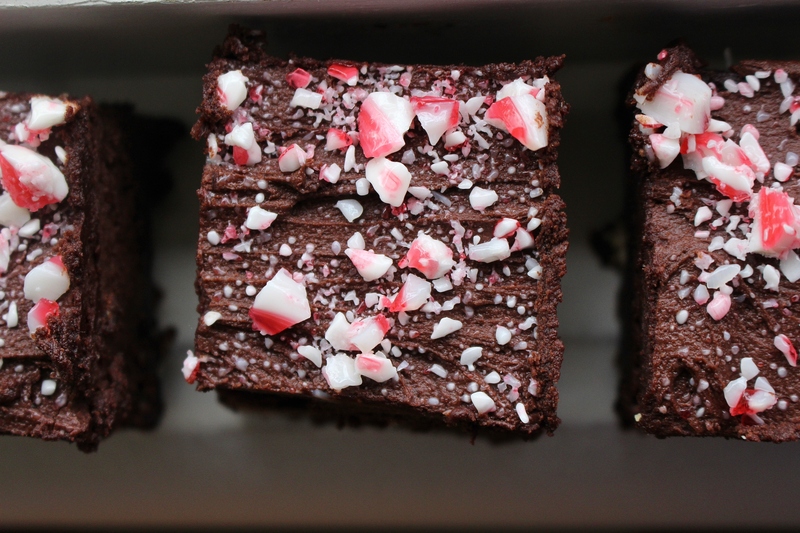 Beetroot is the plant world’s gift to chocolate baked goods. Baked, cooled, and pureed into thick magenta paste and then added to melted midnight black chocolate, beetroot is chocolate’s perfect Valentine. You can’t taste the beetroot here, but it adds a little earthy magic that highlights the slightly bitter notes of dark chocolate. 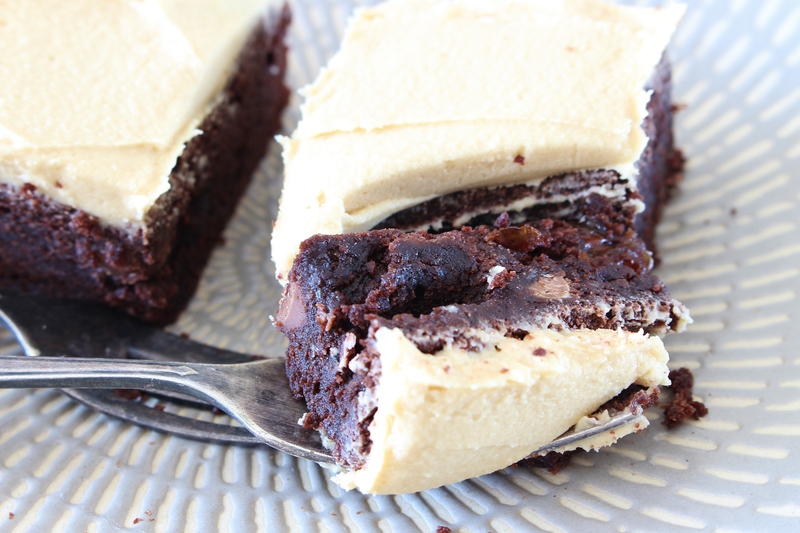 These aren’t brownies for the faint of heart. 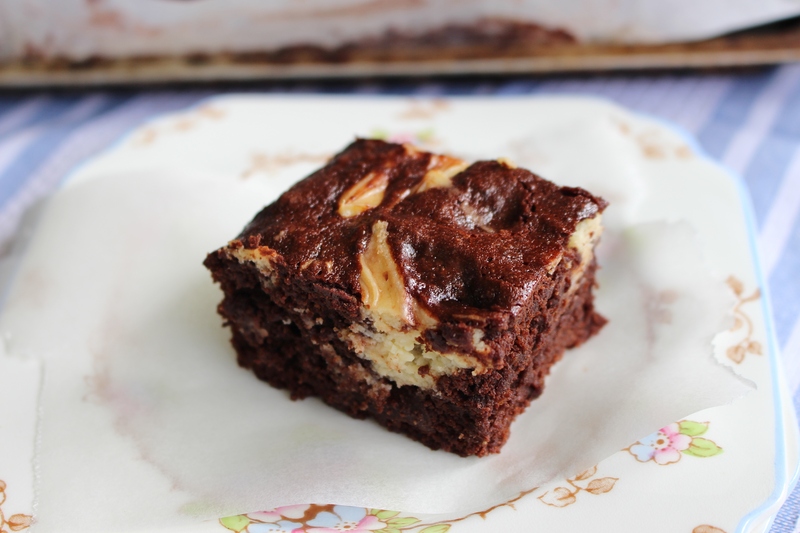 They are rich, dark, deep in the earth brownies that require coffee and fine plates. 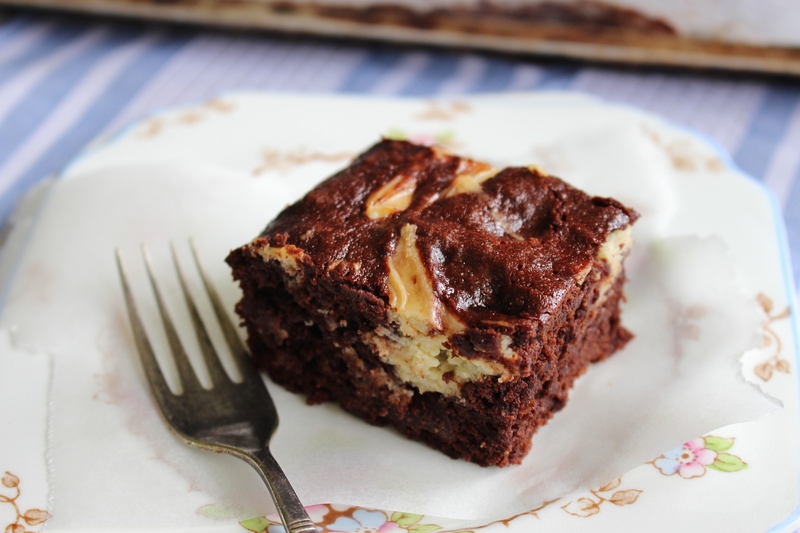 Brownies that hit that spot of craving for dark chocolate. 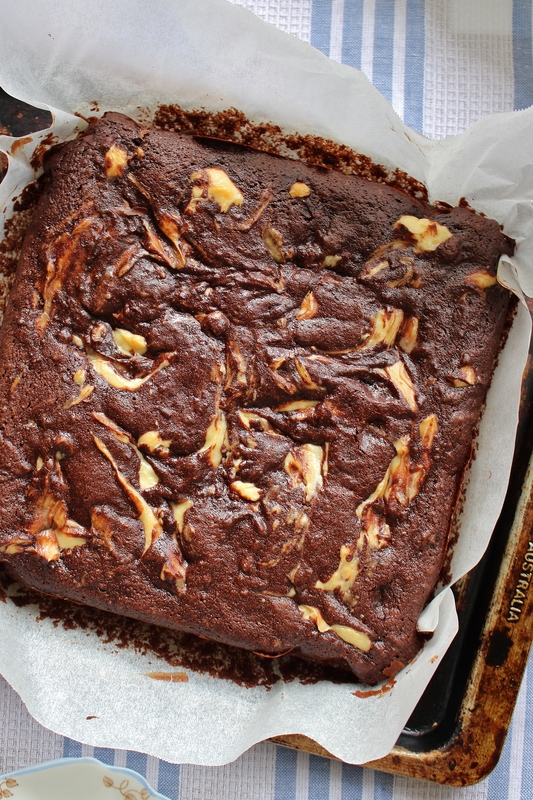 To this deep, dark beetroot brownie batter we add dollops and swirls of sweet and sharp cream cheese. Not so much to overwhelm, but just enough to provide a creamy contrast. 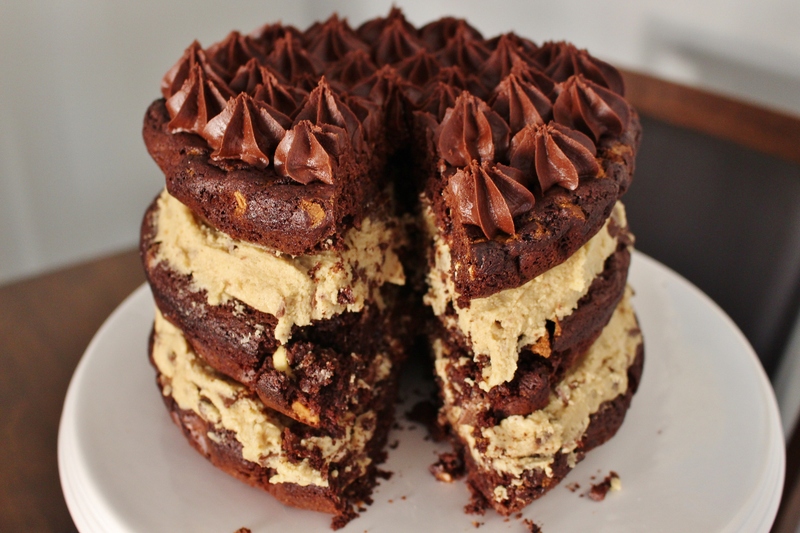 Each bite is a mouthful of dark dense brownie with a tiny cheesecake ripple. 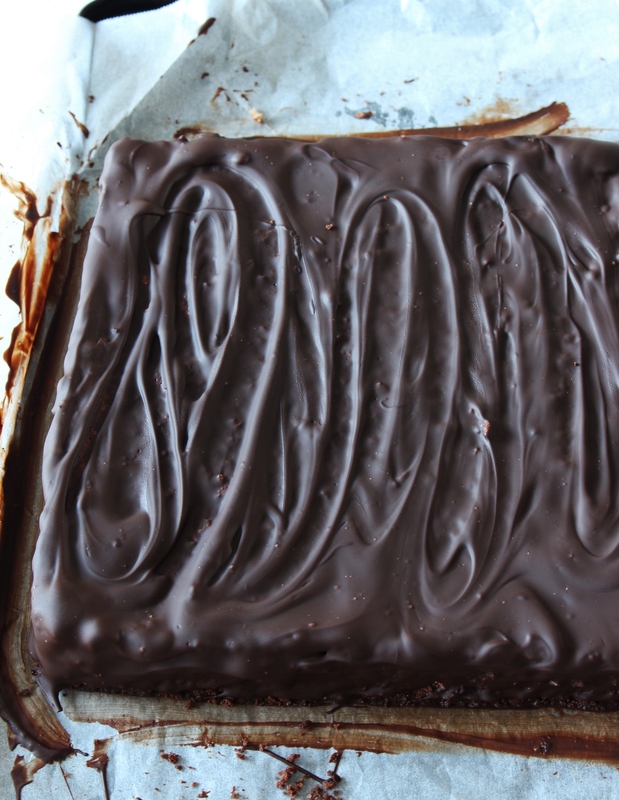 These brownies are elegantly simple. 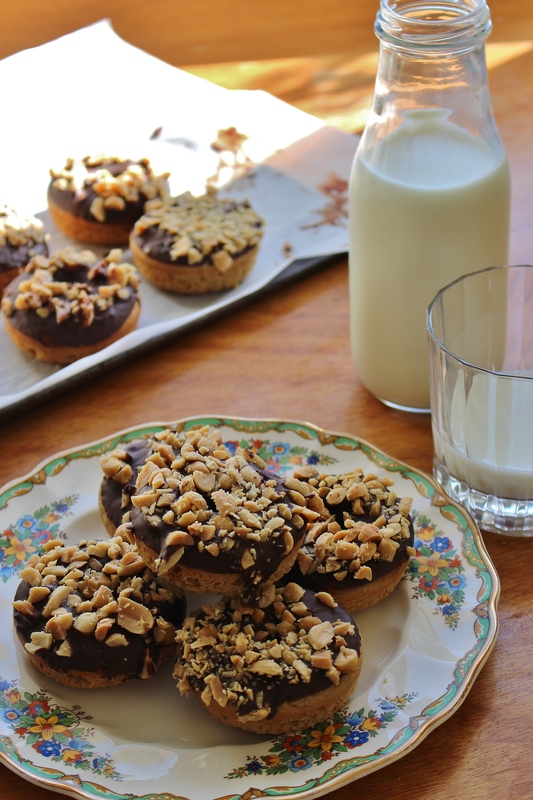 Decadent enough in themselves to not require any frosting or extra add-ins. They are lush and classic and perfect for a chocolate treat for the one you love. I took these brownies to a dinner with Chris’s family over the weekend, and we returned with an empty pan. His sister (hi Rosie!) even snuck a container of the leftovers into her handbag before she left. I stood in the kitchen and ate one and a half of these while sipping on a cup of tea. When you feel comfortable enough to start cutting brownie slivers in half in front of people, you know you have found love. Preheat oven to 200C. Wrap beetroot in aluminium foil and bake for an hour, or until beetroot are tender in the middle when pierced with a skewer. Allow to cool completely before peeling. Once cooled roughly chop and use a food processor or blender to puree to a smooth paste (you can add up to 1 tablespoon of water if required). Preheat oven to 180C and line a 9-inch (22.5 cm) square tin with baking paper. Set aside until required. In a medium bowl beat together beetroot puree and oil. Place chocolate in a microwave safe bowl and heat in 30 second bursts, stirring well in between bursts, until smooth and melted. Allow to cool and then mix into beetroot mixture. In a separate bowl whisk together cocoa powder, buckwheat flour, brown rice flour, hazelnut meal, and baking powder. In the bowl of a standmixer fitted with the paddle attachment, or using a handheld mixer, beat eggs, sugar, and vanilla on medium-high speed until light and fluffy. Reduce speed to low and add beetroot mixture. Add dry ingredients and mix until completely combined. In a small bowl beat cream cheese until light and fluffy. Add icing sugar, white rice flour, and milk and beat until smooth. 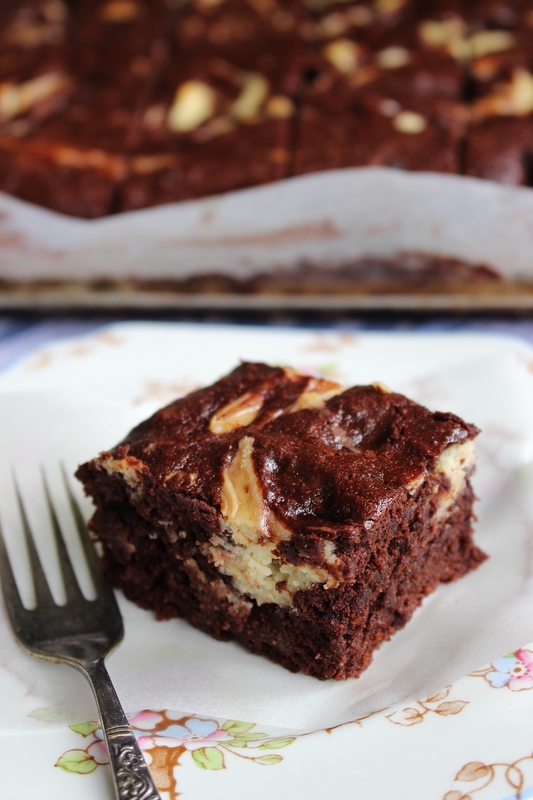 Place small drops of cream cheese mixture in a checkerboard patter on top of brownie batter. Use a thin knife or skewer to pull gently through the mixture in a zig-zag fashion to create swirls. Don’t overmix as this will ruin the swirl effect. Place into preheated oven and bake for 45 minutes or until a skewer inserted into the middle comes out with only a few moist crumbs clinging to it. Allow to cool completely before cutting into squares and serving. Are you a beetroot and chocolate lover? How are you spending your Valentine’s Day? 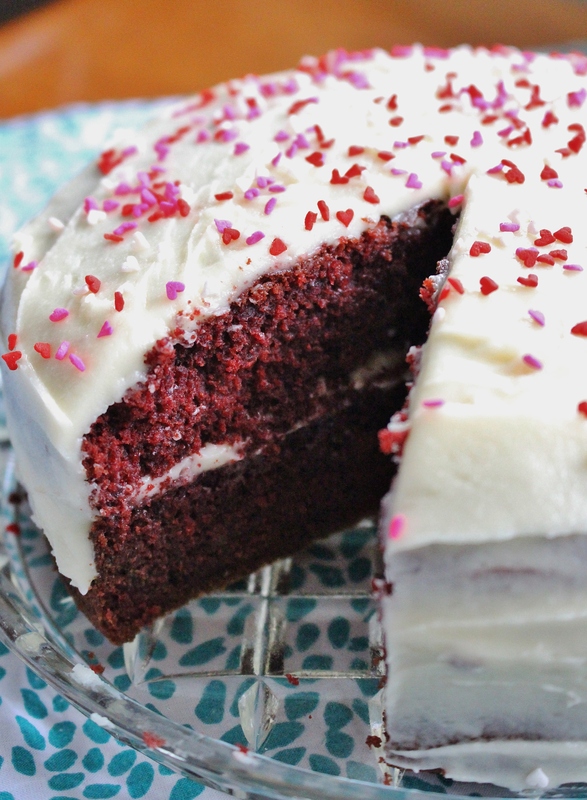 Fluffy and moist with just a hint of chocolate and deep red colouring, this gluten free red velvet cake with cream cheese frosting is the perfect special treat, especially when topped with vanilla-laced cream cheese frosting. 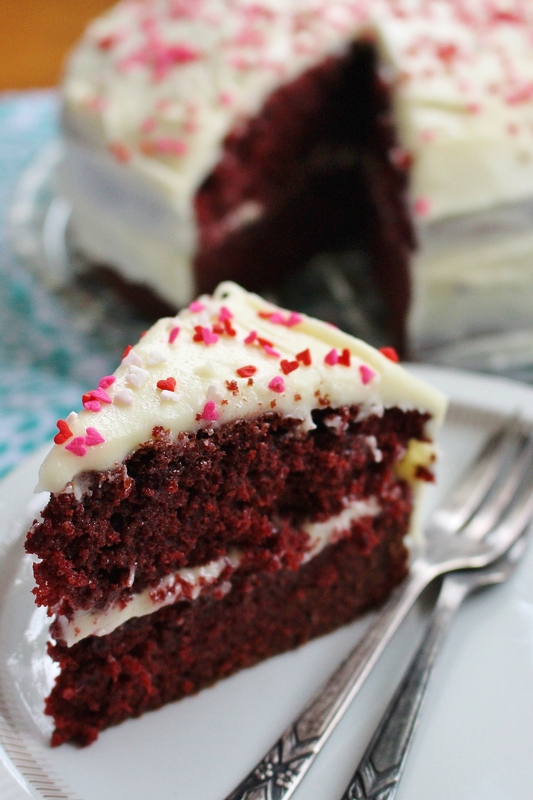 Red velvet cake is a little like love itself. When you first come across it, you don’t know how to categorise it. You can appreciate its beauty, the feeling of sinking into it, but try to examine it more closely and it flies apart into elements so disparate that you can’t fathom how they come together to form the wondrous whole. Luckily for us, red velvet cake proves a lot easier to examine and recreate in our own kitchens. The recipe for love, I leave to you all to figure out for yourselves. Mine involves 1 tall, geeky ginger + 1 nerdy, cookbook obsessed brunette = love. The recipe for a lush, gluten free red velvet cake with tangy, vanilla scented cream cheese frosting, that, I can help you with. 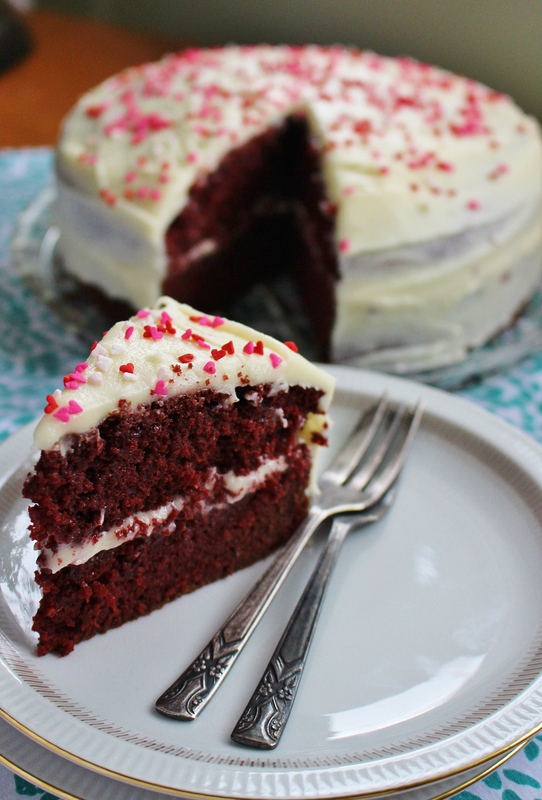 I wanted to give you a red velvet cake for Valentine’s Day. To show my love for you all, and your support here on Thoroughly Nourished Life. Like any project of love, it took some experimenting. Third time round, I figured out the formula for a fluffy, moist, tightly crumbed cake with a stunning deep red hue. Red velvet isn’t a cake for everyone. This cake walks the line between chocolate and vanilla. You will keep going back for slice after slice just to try and figure it out. I’m okay with that. The secrets of love, those I also have no idea how to solve, the secrets of the perfect gluten free red velvet cake, those I can decode. It starts with creaming butter and sugar to pearled perfection. To that we add eggs, a decent dose of vanilla, and pillar box red food colouring. 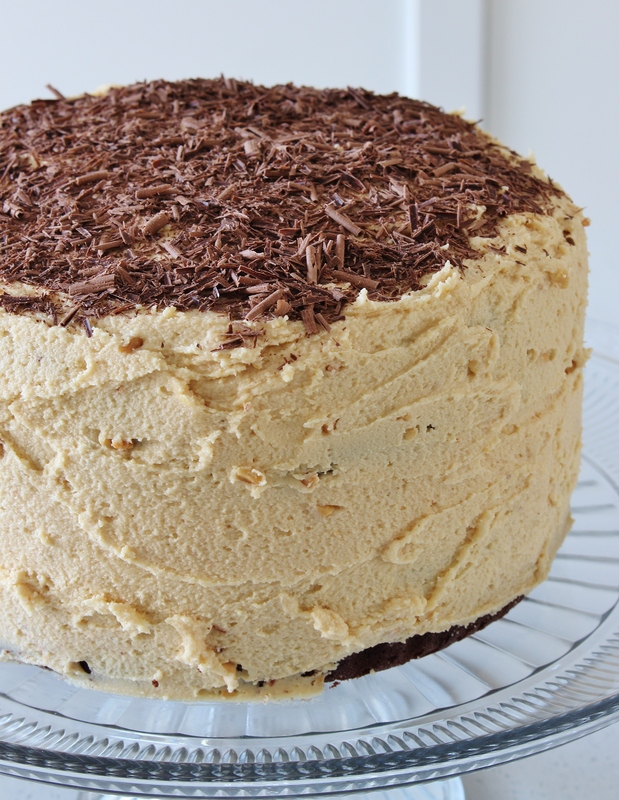 This cake uses a simple mix of three gluten free flours, and these are added to the mix along with cocoa powder, and the key ingredient in red velvet cake’s moist and moreish texture – buttermilk. Buttermilk, combined with baking soda and a touch of lemon juice, gives this cake it’s lift and the tender crumb that defines red velvet cake from merely a red-coloured vanilla cake. After your cake is baked and cooled, then the magic happens: you whip together cream cheese, icing sugar, vanilla essence, and lemon juice to create dreamy cream cheese frosting. 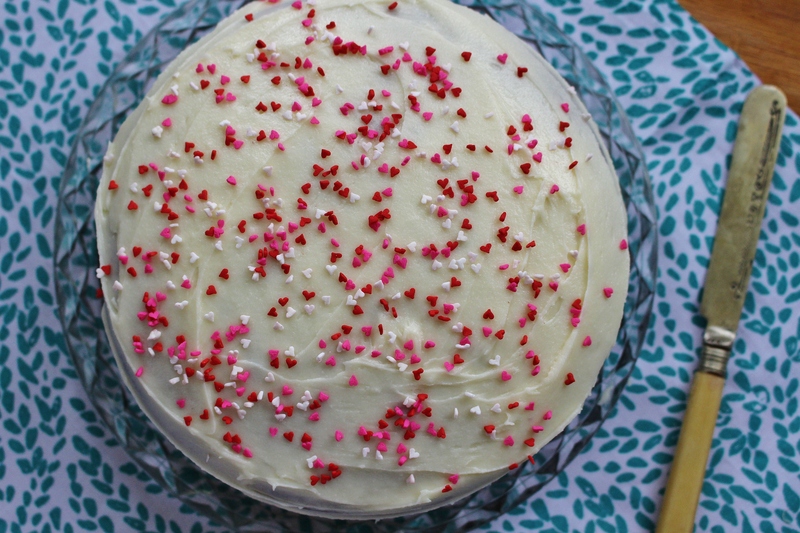 Cream cheese frosting is the perfect dancing partner for red velvet cake. 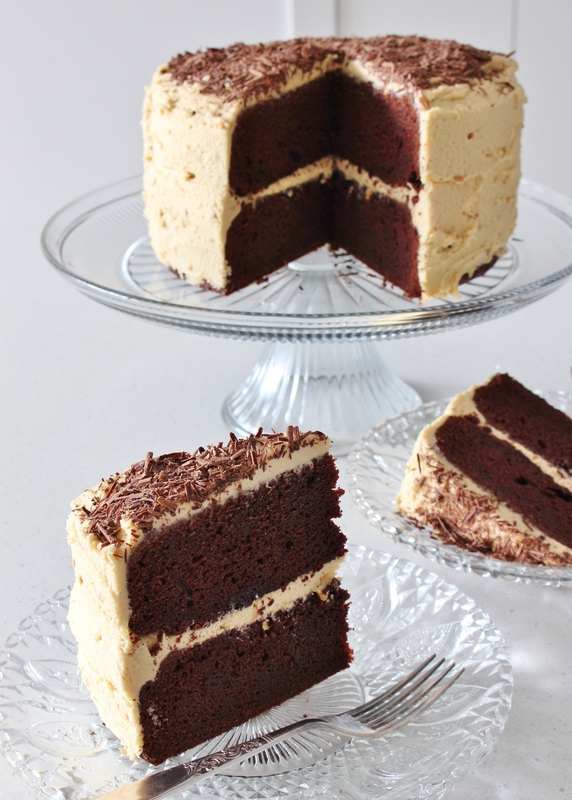 The tangy, smooth cream cheese contrasts with this cake and highlights the balance between vanilla and chocolate to perfection, like a delicious, velvety tango for your taste buds. From me, to you, this Valentine’s Day. Red velvet perfection. Preheat oven to 180C. Butter and line on 7-inch (18 cm) round cake tin with baking paper. In a small bowl whisk together the warm water and cocoa powder. Allow to cool and then mix in the buttermilk and chia seeds. Set aside until required. In a separate bowl whisk together the buckwheat flour, white rice flour, and brown rice flour. Set aside until needed. In the bowl of a stand mixer fitted with the paddle attachment (or in a large bowl using a handheld mixer) beat butter and sugar on medium-high until light and creamy, about 3 minutes. The butter and sugar should be very pale by this stage. Beat in eggs one at a time. Scrape down the sides of the bowl between each addition. Add red food colouring, vanilla essence, and salt. Beat until completely incorporated. Turn mixer speed to low and beat in flour in three parts alternating with buttermilk and cocoa mixture. Scrape down the sides and bottom of the bowl as required. Beat until just combined. In a small bowl mix together baking soda and lemon juice so that it foams. Quickly mix into cake batter. Pour cake batter into prepared baking tin and bake for 40-45 minutes or until a wooden skewer inserted into the middle comes out clean. Once the cake is cooked, remove from the oven. Allow to cool in the pan for 10 minutes, then remove from tin and allow to cool completely before frosting and decorating as desired. Use this time to make and refrigerate the frosting. To decorate the cake, split the cake into two layers. Use a serrated edge knife to make the job easier. 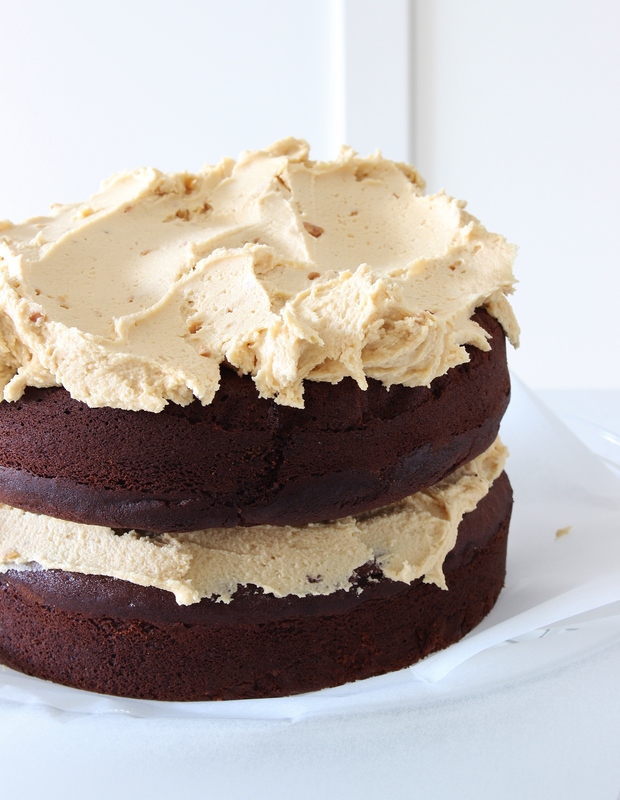 Place one layer of cake on a plate and spread with half the frosting. Top with the second layer of cake and spread with the remainder of the frosting. Decorate with sprinkles, or as desired. In a medium size bowl beat together the cream cheese, lemon juice, vanilla essence, and 3 cups of the icing sugar until smooth. If your mixture is too runny beat in the extra cup of icing sugar. Tell me, dear reader, are you a red velvet fan? What’s your recipe for love?